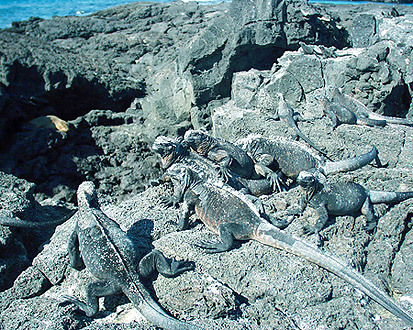 Marine iguanas, Amblyrhynchus cristatus (Bell, 1825), are the world’s only sea-going lizards and are a gray to black iguana with pyramid-shaped dorsal (upper) scales. They are distinguished from land iguanas by their short, blunt snouts and slightly laterally compressed tail which efficiently moves this lizard along the surface or beneath the water. Juveniles have a light stripe along the dorsal side. The long, sharp, recurved claws permit the lizard to hold fast to the lava in heavy seas or when submerged. The average length of an adult male is approximately 1.3 m and an adult female is approximately 0.6 m in length. 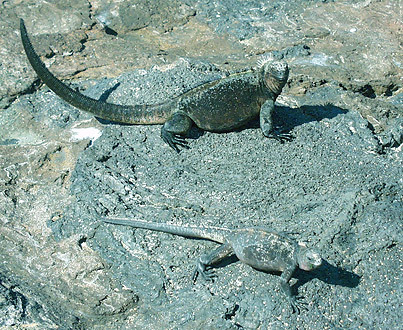 The weight of these iguanas range between 0.5-1.5 kg (Berry 1984). 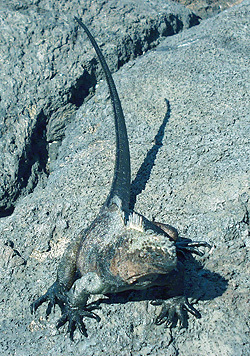 Like many lizard species, marine iguanas are often found basking in the sun. This species must warm its body after swimming in cold ocean waters in search of food because reptiles do not have the ability to thermoregulate. Their dark color allows them to absorb heat quickly. When their body temperature is low, these animals move more sluggishly and are therefore at greater risk of predators. To counter this vulnerability, the marine iguana displays a highly aggressive behavior to bluff its way to escape. The marine iguana is dependent on its marine environment and is consequently equipped with a nasal gland to excrete excess salt. Marine iguanas are only found in the Galapagos Islands archipelago off the coast of South America. Because the Galapagos have never been part of a continent, it is believed that the marine iguana was brought to the islands from South America. It is also thought that land and marine iguanas diverged from a common ancestor at least 10 million years ago islands in the archipelago that are now under water. 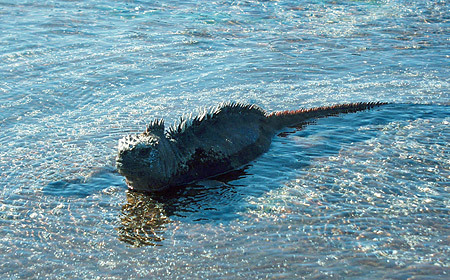 Marine iguanas are widely distributed throughout the islands. Although the different populations vary in size and color, they are all considered to be a single species. The smallest are found on Genovesa, and some of the largest are on Fernandina and Isabela. Espanola boasts the most differentiated, colorful iguanas. These marine iguanas have blotches of coppery green and red. The red pigment comes from a particular seaweed that blooms during the summer months, which also coincides with the iguanas’ mating season. 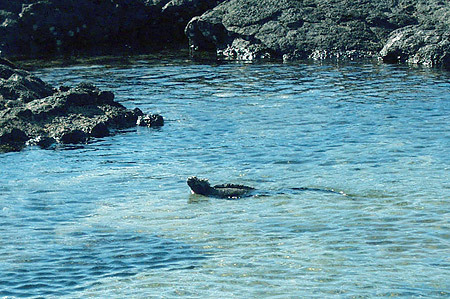 The marine iguana enjoys a habitat with few predators. Known predators are hawks, owls, snakes, crabs, rats, and feral dogs and cats. Both adult iguanas and their eggs are preyed upon. Females are especially at risk of predation during breeding season in the open nesting areas. Before feeding the marine iguana must raise its body temperatures to approximately 36°C. These iguanas are ectotherms and can lose up to 10°C when in the ocean. To regulate their body temperature they must bask in the sun for long periods of time. 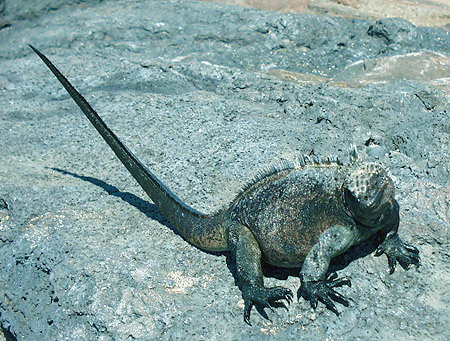 Marine iguanas are herbivores that feed primarily on marine algae. Large adults feed frequently, often diving during high tide. Dives are typically shallow, 1.5-5 m, but large adults dive to depths of 15 m or more. Dive times are usually only a few minutes long, but there are records of marine iguanas being submerged for more than half an hour. Juveniles feed in the intertidal zone during low tide. In 1982-1983, an El Nino-Southern Oscillation Event (ENSO) caused high rainfall and increased sea level and surface temperatures resulting in a decrease in biological productivity. 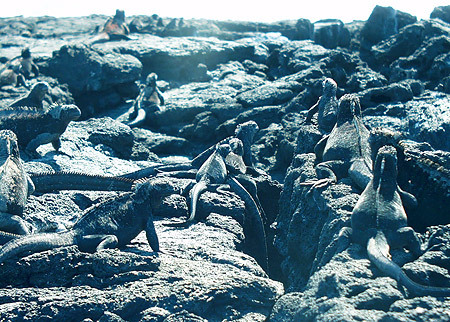 Because marine iguanas are dependent on marine flora, populations declined during this time, but have since recovered. Breeding season is December-March. Nesting season lasts from January-April. Females reach sexual maturity when 3-5 years old. Males when they are approximately 6-8 years old. Mating territories are defended by males. Females dig burrows in the sand 30-80 cm deep and up to 300 m inland where they lay 1-6 eggs. Females guard the burrow for several days then leave the eggs to incubate for about 89 to 120 days. 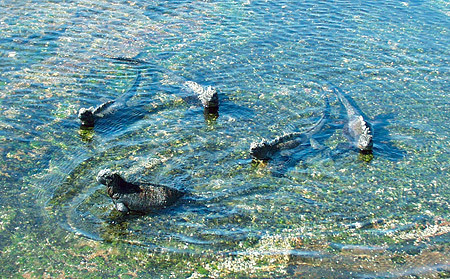 Hybridization between the Galapagos land and marine iguanas has been documented on Plaza Sur, however this is not a common occurrence. When the infants hatch the iguana can weigh about 50-60 g. Upon hatching the infants tend to look around and then immediately run, often bipedally, to the nearest cover. This species is completely protected by national legislation (Ecuador). They are listed under CITES Appendix II (nearly threatened with extinction). Eibl-Eibesfeldt, I. Galapagos. Pergamon Press, Oxford, 1984.